Under the Bougainville peace agreement, to which Australia was a witness, the signatory is the central government in Papua New Guinea and the established Autonomous Bougainville Government. They agreed to a referendum window of 2015 to 2020 for there to be a question or questions put to the people of Bougainville about the future status of that province. One of those questions has to address the issue of possible independence for Bougainville. The Bougainville authorities, the Autonomous Bougainville Government and the authorities in Port Moresby, the Papua New Guinea National Government led by Prime Minister O’Neill, have been in discussions with each other. Those discussions have waxed and waned. I think we have noticed recently, as we get closer to the opening of that referendum window, that there has been some new positive and very welcome, from our point of view, momentum behind those consultations. Those consultations, obviously, involve a range of players both from Bougainville and the central government, including the three Bougainville representatives who sit in the National Parliament in Port Moresby. The leader from the Bougainville side is the leader of the Autonomous Bougainville Government, Mr Momis. There are in the Bougainville peace agreement references to a number of things that should happen as we approach the referendum window. I emphasise there is no certainty on dates within that quite wide five-year window. The question of timing for a referendum is one under the agreement that needs to be settled between the National Government of Papua New Guinea and the Autonomous Bougainville Government. Similarly, the conditions and arrangements for that referendum have to be settled in that way. Senator RHIANNON: Thank you, Chair. In 2013, USAID issued its Bougainville stability desk study and issued warnings about instability with regard to Bougainville. In 2008, there was an AusAID report called Market chain development in peace building: Australia’s roads, wharves and agriculture projects in post-conflict Bougainville that also warned that re-opening the Panguna mine on Bougainville was a high risk operation that could generate significant instability. Does the department accept this view? What is the current position with regard to reopening the mine? Ms Klugman: I will just get to the right notes. Your question mentioned agriculture and a few other things and stability, but your question was about the future of the Panguna mine. You should rest assured, Senator, that both sides of the debate on the future of Bougainville—that is, the sovereign government of Papua New Guinea as well as the autonomous province of Bougainville—are fully aware of the role that both land and other issues around the Panguna mine played in the troubles. They are very focused on the future of that mine. The future of the Panguna mine is quite clearly a matter for the government of Papua New Guinea through its arrangements with the autonomous Bougainville government, the resource sector being one of the areas of autonomous power being drawn by the autonomous Bougainville government under the Bougainville peace agreements. Senator RHIANNON: So do I take from that that the Australian government does not have a position if it should be re-opened or do you have a position if it would be beneficial to Bougainville and PNG if the mine re-opened? Ms Klugman: That is a matter for PNG and Bougainville. Senator RHIANNON: Is the department aware of allegations in the British Journal of Criminology, volume 52, issue No 4, page 705: ‘Testimony from senior Australian Government officials is presented which strongly suggests the Australian Government supported PNG defence force operations on Bougainville during 1989 to 1992 and to that end provided direct military assistance, including ADF officers who helped plan the counter insurgency campaign.’ Is the department aware of these allegations and has any follow-up occurred since that article was printed? Ms Klugman: I am not aware of that article. I am happy to take that question on notice. Senator Brandis: I am not aware that the department of foreign affairs regularly subscribes to the British Journal of Criminology. Senator RHIANNON: Senator, you are aware that was my question. But as it involves Australian government officials who were named as being quite senior, I thought it may have come to their attention. I am happy for it to go on notice. Senator Brandis: Who was the author of the article? Senator RHIANNON: You will be able to find all that out. I have not got much time; so I would like to move on. Senator RHIANNON: Last night you told me I could not ask questions. Now you are saying I cannot come in here. Senator Brandis: If I may finish, please, without being interrupted. You cannot just come in here and quote from an article that nobody has ever heard of and which has no bearing upon the work of DFAT and when you are asked to identify the author, decline to do so. These are serious allegations made against Australian personnel in the area and you will not cite your source. Senator RHIANNON: This is the opportunity to clear the air. Senator Brandis: You are the person who has raised the scandalous allegation. Senator RHIANNON: Surely that is what estimates is about. Senator Brandis: You will not even identify your source. Senator RHIANNON: I have identified the source and I gave it to you right down to the page number. Senator RHIANNON: I am happy to put it on notice later, the whole article. Senator Brandis: So you have made a scandalous allegation against members of the ADF. Senator Brandis: You won’t even tell us who was making the allegation. Senator RHIANNON: That it is not a reputable source? Senator Brandis: It may not be a reputable source. It may not be a reputable person. Senator RHIANNON: Again it is your time-wasting exercises. Senator Brandis: Until we know who was the author of the article, how can we make a judgment about its reputability? Senator RHIANNON: A freedom of information request was lodged by the Corporate Responsibility Coalition in Britain. It appears that the Australian government, from the information that was released, joined with their British counterparts to lodge an amicus curiae brief in support of Rio Tinto after it was sued under the alien tort statute for human rights abuses on Bougainville. Given this helped to block victims of war crimes from obtaining a potential remedy in the US courts, can the department explain why the Australian government decided to oppose the legal action? Senator Brandis: Again, this question is even more foolish because your question is based on an assertion. It appears—from whom? Senator RHIANNON: The Corporate Responsibility Coalition in Britain put it in. It is there on notice. Senator RHIANNON: Again, it is an opportunity to clear the air. What is wrong with that? Senator Brandis: So some lobby group in a foreign country of whom nobody has ever heard has put in a freedom of information request. On that extremely slender basis, you are making allegations against the Australian government. What is your source? Senator RHIANNON: Ms Klugman, will you take that on notice, please? Senator Brandis: No, we will not take that on notice. Senator RHIANNON: You will not even take it on notice? Senator Brandis: We will not even take it on notice. We will not dignify it with a response because it is absurd. Senator RHIANNON: Thank you, Chair. It says it all, coming from the minister. Senator FAWCETT: Can I just follow up on Bougainville since we are on that topic. Ms Klugman, I am assuming you are probably the one to ask. You are obviously aware of that peace agreement which led to the understanding that there could be a referendum on independence between 2015 at the earliest and 2020 at the latest. Ms Klugman: That is correct. Senator FAWCETT: Could you update the committee on where we believe that sentiment is at in terms of desire for it and particularly a couple of the requirements that are being discussed? One is weapons disposal, particularly from the BRA, and also requirements for better governance before we move down that path. Ms Klugman: Yes, you are quite correct. Under the Bougainville peace agreement, to which Australia was a witness, the signatory is the central government in Papua New Guinea and the established Autonomous Bougainville Government. They agreed to a referendum window of 2015 to 2020 for there to be a question or questions put to the people of Bougainville about the future status of that province. One of those questions has to address the issue of possible independence for Bougainville. The Bougainville authorities, the Autonomous Bougainville Government and the authorities in Port Moresby, the Papua New Guinea National Government led by Prime Minister O’Neill, have been in discussions with each other. Those discussions have waxed and waned. I think we have noticed recently, as we get closer to the opening of that referendum window, that there has been some new positive and very welcome, from our point of view, momentum behind those consultations. I referred to some new momentum. I think I had focused in particular on a visit that was made two months ago to Bougainville by Prime Minister O’Neill himself. That was the first visit by Prime Minister O’Neill to that province. 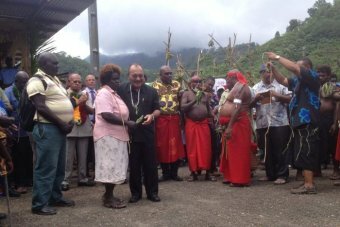 Indeed it was the first time a Papua New Guinea Prime Minister had been to Bougainville for many years. There were some reconciliation ceremonies and events that preceded that visit, which are important in the context of the history of the conflict in that place. For our part, Australia, as a neighbour, as a close friend of Papua New Guinea and, by the way, as a witness to that peace agreement, have been stepping up, through Ms Bishop our dialogue with the leadership in Papua New Guinea on those questions, the questions of referendum, the questions of Australian assistance with economic development activities in Bougainville as part of our broader aid program in Papua New Guinea. I think we are in a phase, I would say, of stepped-up interaction and dialogue with the two principal players in this matter, which are the government of Papua New Guinea and the government of that autonomous province. Ms Klugman: Yes, we are doing both of those things. You mentioned two issues which are prominent in the agreement itself. In the letter of the agreement, they are not conditions for a referendum but they are very much pre-conditions for a referendum but they are important conditions for a successful and peaceful act of successful and peaceful referendum in that country. There is still a lot of ordnance left over. You mentioned the weapons disposal but there is also a lot of UXO disposal which we have been involved in, in particular through the role of the Australian Defence Force in Operation Render Safe, which is an operation that goes beyond Papua New Guinea but there is a particular focus on Papua New Guinea. Its purpose is to clean up damaging ordnance left over from the Second World War. we all knew that the Australian govt was very involved with the PNGDF. We saw the helicopters that were used during the civil war. how the hack are they denying that and want evidence when there are thousands of Bougainvillians who can give the evidence they want!